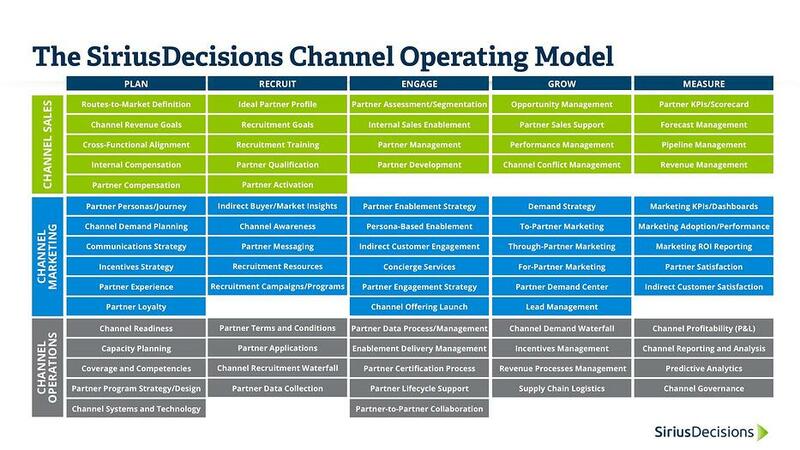 The SiriusDecisions Channel Operating Model is a comprehensive framework on the key processes and activities, by function, required to build, manage and grow a successful indirect business. As an agency, we use it with many of our clients when developing content and programs aimed at partners or their buyers. The model originally debuted back in 2015 as the SiriusDecisions Channel Program Model and has undergone some minor revisions. In September 2017, a new version of the model was released. Kathy Contreras, Senior Research Director, Channel Marketing Strategies at SiriusDecisions, along with other analysts from SiriusDecisions Channel Marketing Strategies and Channel Sales Strategies services played a role in the development of the new model and took some time to review the highlights with us. David (GET LIFT): Can you provide a brief overview of the 5 stages in the model? Kathy (SiriusDecisions) - While there are 5 stages of the model, they're not necessarily happening sequentially. Most companies will be focused on multiple stages at various times depending on their channel goals and objectives, priorities and maturity. Plan: The first stage focuses on key processes required to build a channel for the first time, as well as those processes and activities that should be evaluated on an annual basis – considerations for development of functional channel plans, budget, and your intent for that year. Recruit: This stage covers the key functional processes and activities involved in identifying, recruiting and acquiring new partners. Engage: This stage is focused on both engagement and enablement of new and existing partners. This is all about channel readiness and partner productivity. Grow: Focus of this stage is creating channel demand and driving partner revenue. This speaks to the processes needed to improve partner performance in channel demand creation and indirect revenue-producing activities. Measure: The final stage is one that many organizations struggle with. However, it’s critical to think about how you will evaluate channel performance and success and what data collection is required to assess that. The measurements aren’t only confined to revenue or pipeline. There are critical measurements across all stages that can guide you on how to optimize your channel efforts. David: What prompted the change in the model? Kathy: We debuted the original model in 2015, and as we continue to use the model with clients, we have identified opportunities to expand it to its current state. Our two channel services, Channel Marketing Strategies, and Channel Sales Strategies worked closely together to develop the newly updated model. David: Would you say the changes are incremental or reconstructive? Kathy: We’ve made some incremental changes over the last couple of years, but this time we reconstructed it on what we see based on best practices and made some changes that we'd wanted to make for a while. It retains the original structure, in terms of looking at it from a functional perspective of channel sales, marketing, and operations. We also kept the discrete changes, although we changed a few titles to help with the focus. We added many new processes and activities. When I go through and look at the new model in terms of what we changed versus what we removed, versus what we added, there were some very significant changes from the first version to this one. Kathy – There are a couple of ways to think about this. Having powerful insights about your target market/buyers enable you to make sure you have aligned your route-to-market strategy towards the right types of partners. Your channel efforts can only be successful if you are recruiting partners that are already serving the ideal target market and this is why it’s in the Recruit stage. Buyer Insights also play a huge role in Engage and Grow as they are significant inputs to your campaigns to, through and for partners. So it could have been included in those stages as well, but we kept it prominent at an early stage so that it’s not missed later on. David: What would you say the three most important or impactful changes that Channel Marketers should pay attention to? Kathy: I think that's going to be a question that would be different by partner and vendor. I believe that we've put some great thought into each of the sections. I’m going to be more focused on the channel marketing section because I'm not as close to where sales focused their changes and efforts. Everyone values greater insights that help drive channel demand and generated indirect revenue. We’ve added key processes and activities in the Recruit, and newly-retitled Engage stages where Channel Marketing has the opportunity to provide market insights both to the internal organization as well as extend buyer insights to the partners. This may include working with product teams to identify unique indirect buyer or market requirements and providing opportunities for product managers to gain insight on partner needs and requirements. While during the Engage stage, channel marketing should also aim to enable partners with buyers’ journey and buyer persona profiles to support their marketing and sales efforts. The Engage stage used to be titled Enable. It was retitled to focus beyond just enablement to encompass those processes and activities that are critical for partner enablement and ongoing engagement. For enablement processes, we now introduce the importance of persona-based enablement which means looking at each partner based on their type of model (ISV, VAR, reseller, etc.) and even the enablement audience’s role (execs, technical, marketing, sales, professional service, etc.) and tailoring your enablement and engagement strategy to them. This means rethinking your training, certification and tools and how to make it most relevant. While this has long been a best practice and included in SiriusDecisions models and frameworks, it is now adequately represented in the Channel Operating Model. Many organizations have corporate strategies, and entire functions focused Customer Experience or Customer Success. This focus should be carried forward into the channel, but with a focus on partner experience and partner success. This trend has been growing in the last few years, and it’s really about how you should evaluate your partner satisfaction, what you need to consider and what are best practices around how to listen to your partners. And then what do you do with that information once you have it. How do you use it to make changes in your programmatic efforts with partners to achieve or raise a standard of partner excellence? Now pair this with a new addition in the Plan stage which is Partner Loyalty, and you can see there’s more focus on creating sustainable success from the onset. These should be thought through at all stages and is supported by the need to formalize processes to evaluate partner satisfaction in the Measure stage. To read more of Kathy's thoughts around the new Channel Operating Model take a look at this post on the SiriusDecisions Blog. David Pereira David is the president of GET LIFT Agency. 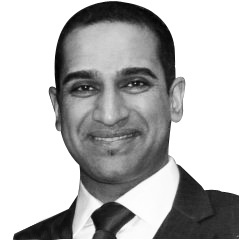 He is passionate about solving B2B marketing problems with practical solutions. He also has a soft spot for chicken and waffles and Toronto sports teams.